When you receive a notification on your iOS device the banner covers some of the content on your screen, thereby conflicting your view. If you happen to have a jailbroken device, then you’re in luck. 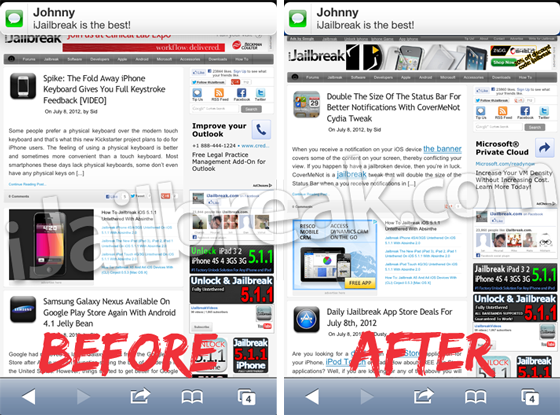 CoverMeNot is a jailbreak tweak that will double the size of the Status Bar when a you receive notifications in banner style. Though CoverMeNot is not the most complex tweak, it happens to be a feature that the iOS notification system lacks. As I mentioned earlier, CoverMeNote doubles the size of the Status Bar whenever there’s a notification banner. This way, the onscreen content is not disturbed as it is pulled down to let the complete banner show itself. There’s no settings whatsoever and the Status Bar goes back to its normal size once the notification banner disappears. A simple tweak, yet useful. Install, respring and you’re good to go. You can download CoverMeNot from the ModMyi repo for free. It has been developed by cjori, the creator of Dashboard X, so it should work without any problems. Try it out and let us know if it was useful in the comments. How To: Downgrade Cydia and Fix any Errors Associated with Cydia 1.1.x!